Where are Israel's fire extinguishing planes? The fire extinguishing planes from abroad which have been carrying out flights over the Carmel region in ongoing efforts to contain and put out the fires which have been raging in the area raise the obvious question: Why doesn't Israel have fire extinguishing planes? A source within Israel Aerospace Industries (IAI) told Ynet on Saturday that Israel never sent a request for fire extinguishing planes. The IAI converts large passenger planes to cargo planes or fire extinguishing planes. Not long ago the IAI completed the conversion of a Boeing 767 for Columbia. The plane's function is to refuel fighter jets in long distance operations. In fact, the plane could carry water as well, thus helping in fire extinguishing efforts. The source said that converting planes for various activities is an option. It is possible to take the interior contents of the plane, and instead of passenger seating, completely change the interior of the aircraft and add refueling tanks. "The problem is that no one ordered such a project and no one approached us, without a client order the IAI can't do it of its own accord." Passengers who passed by the IAI hangars at Ben Gurion Airport over the past few days were surprised to see the Amphibian fire extinguishing plane, just like those used by Russia in the Carmel region. A source at the IAI confirmed that this is the case. It seems that these are Russian planes that the Indian air force bought for air control purposes. The same planes could be converted to fire extinguishing planes within months. The IAI received an order from India to install advanced control systems, a deal worth $1.1 billion. The source stated that the IAI had experience with such planes and that if an order from the State of Israel were received it would have been possible to convert the planes to fire extinguishing planes. The source also stated that it was possible to purchase the planes in the private sector, like you would a used car. Furthermore, the aviation market slump means that the plane could be purchased at a very low price. "The market for used planes is very good", said the source. "You bring the plane to the IAI and they convert it to the specified purpose." The harsh criticism directed at the decision makers is for their incompetence and lack of preparation for the possibility of a fire and the fact that Israel is lacking any fire extinguishing planes, something you don't expect from a technologically advanced state. The money saved over the years in the annual budget, will be paid with interest in restoration of the Carmel and compensation payments to the thousands affected by the fire, in both loss of life and loss of property. Greece has prepared for the possibility of fires of this type in advance. The Greek air force team arrived in Israel with Canadian Bombardier planes. The company has an Israeli representative and her main operation in Israel consist of selling train coaches to Israel Rail – coaches which the company itself manufactures. Bombardier is the world's largest train manufacturing company which also manufactures passenger planes, executive planes and fire extinguishing planes. Bombardier noted that the fire extinguishing planes are priced from $10 million for the basic model to $20 million for the fully equipped advanced models. The plane is usually supplied within a year of an order being placed. A source within the company stated that the Bombardier had not received a request from Israeli sources to purchase fire extinguishing planes. 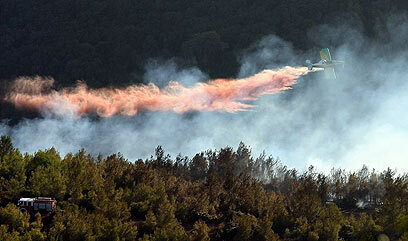 See all talkbacks "Where are Israel's fire extinguishing planes? "